Background: Acquiring experience and surgical skills in maxillofacial surgery and anaesthesia depend on an optimal case volume and case mix. The more opportunities available for hands-on participation in various surgical operations, the better for the maxillofacial surgical team. Building and equipping operating rooms (ORs) are high-cost intensive projects. The aim of this study was to find if the current operative case mix and volume justifies capital investment in maxillofacial surgery-specific ORs. Methods: This is a descriptive, nonexperimental quantitative research. We reviewed the maxillofacial OR records from November 2008 to December 2013. Data collected from the maxillofacial theatre records were incorporated into an SPSS v 22 spreadsheet and analysed. The OR utilisation time was computed. The analysis was performed to guide managerial and investment decisions. Results: A total of 175 maxillofacial operative cases reviewed from a period of 62 months gave a rate of 2.8 cases per month. More males 90 (51.4%) than females 85 (48.6%) were operated on. Of the 236 operating days, 129 days (54.7%) were utilised. Major and major/smile-train operations formed 73.7% of all operations performed. All operations started after 10 am. Conclusion: The maxillofacial case volume and output do not justify the need for capital investment into building surgery-specific ORs. However, there is a need to improve OR management and put in place strategies that will optimise the present facility. Maxillofacial surgery is one of the relatively new units established at the University of Port Harcourt Teaching Hospital (UPTH), Nigeria coming long after general surgery, obstetric and gynaecologic surgeries which have been in existence since the establishment of the hospital over three decades ago. A theatre complex consisting of two operating rooms (OR) is designated for ophthalmology, ear, nose and throat (ENT) and maxillofacial operations. The maxillofacial surgeons share one OR with the ENT surgeons. While elective maxillofacial operations are scheduled for 1 day/week, ENT operates twice a week. Ophthalmology has a specific-OR, but elective operations are scheduled thrice a week. They, however, enjoy some flexibility and can use their OR when the need arise. The pathophysiology peculiar to the eye precludes sharing of the ophthalmology OR with other surgical specialities. The cost of building and equipping ORs in the hospital is enormous and is referred to as the most cost-intensive project. On the contrary, it can also be the most productive unit in any hospital provided it has high-operational efficiency, good organisational structure, good leadership, as well as interdisciplinary collaboration.,, From our experience, any problem that occurs in a theatre complex usually affects all the surgical specialities sharing the OR. There have been situations in our hospital when damage to electrical components and connections, the absence of power and suboptimal performance of the air conditioners have, in one way or the other, disrupted the operation lists. On several occasions, inadequate theatre nurses and support staff, especially shortage of porters, as well as, hospital staff and resident doctors strikes have hindered the scheduling of patients for operations. The operation lists can also be interrupted during post-graduate fellowship examination periods. This is because the resident doctors who are the candidates are away from the hospital to sit for the various mandatory examinations. Similarly, a good number of senior surgeons are also away from the hospital during these times to perform their responsibilities as supervisors and examiners. These interruptions indirectly affect health service delivery, which in turn reduces the opportunities for acquisition of skills by the resident doctors covering the hospital on such occasions. The medical students' postings may likewise be interrupted. Overall, the resulting delays from a reduction in the surgical workforce, lack of staff, or the patient not being prepared on time can amount up to five working days per month. This is a descriptive, nonexperimental quantitative research approved (UPTH/ADM/90/S.II/VOL.X/700) by the University of Port Harcourt Teaching Hospital's Ethics and Research Committee. We retrieved data from the maxillofacial theatre record books. Cases performed from November 2008 to December 2013 (62 months) were entered into an SPSS spreadsheet. The variables were defined and the data that were extracted included patients' coded identity, hospital number, gender, age, type of operation performed and a number of cases. Other relevant data include the class of surgical operation, date and time. The theatre bill is according to the hospital classification of surgical operations, namely minor, sub-major, major and supra-major procedures which reflects the complexity of the operation and extent of anaesthesia. Most surgeries that can be done as day cases are considered minor or sub-major. Supra-major operations are more complex, require more material resources, expertise and time. To avoid quoting monetary value, the revenue unit cost was used and this refers to the theatre fee per class converted to relative unit per class of operation as such minor, sub-major, major and supra-major are assigned 1, 1.6, 3.3 and 4.1, respectively. The total revenue relativity is the number of cases in each class multiplied by the revenue unit cost. We derived the duration of operation from the arrival time into and out of theatre and computed the OR utilisation time. These data were analysed using IBM® SPSS Statistics® version 22 (Armonk, NY: IBM Corp). This descriptive analysis was performed to make informed managerial and investment decisions. A total of 175 maxillofacial operations were analysed from a period of 62 months spanning November 2008 to December 2013 giving a rate of 2.8 cases per month. Of these, 90 (51.4%) were male and 85 (48.6%) were female with a male-to-female (male:female) ratio of 1:0.9. 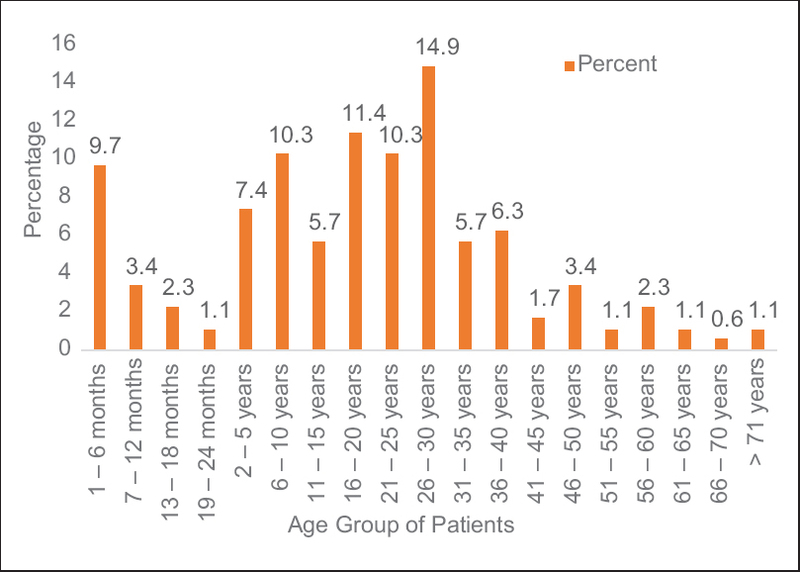 Ages 16–30 years (36.6%) jointly formed over a third of the patients seen while age groups 1–6 months (9.7%) and 6–10 years (10.3%) each formed approximately a tenth of the patients seen during the period [Figure 1]. 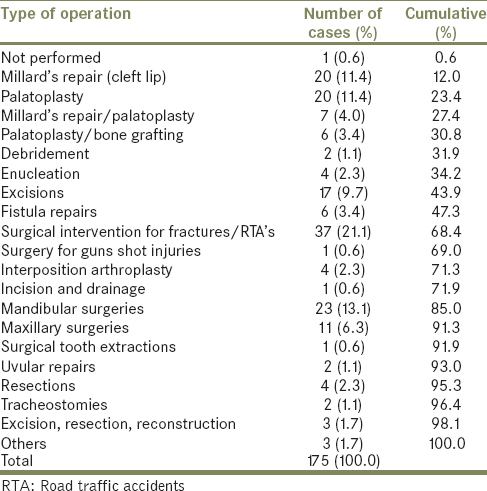 Of the operations performed, 21.1% are surgical interventions for fractures and road traffic accidents; Millard's repair and palatoplasty makeup 26.8% while palatoplasty with bone grafting is 7 (3.4%). Mandibular and maxillary surgeries together form 19.4% of the surgeries performed [Table 1]. The class of operation and revenue unit cost per class of operation are shown in [Table 2]. Major and major/smile-train operations formed 73.7% of all operations performed with a combined total revenue units of 243.21. The actual operating days used in the period analysed was 129 days out of 236 potential (available) operating days giving a 54.7% operating days utilisation. The total operating time duration of maxillofacial surgeons is 462:52 h (51.3% of available operating hours), [Table 3]. The earliest arrival time-in OR (time for the knife on skin or start-time) is 10:01 h and the latest arrival time is 16:43 h while 50% of cases began between 10:01 and 11:34 (50th percentile). The minimum time for an operative procedure is 2 min which was for an elective tracheostomy while the maximum time for a procedure is 8:39 h (519 min). The 50th percentile for the duration is 2 h (120 min) and only 25% of cases lasted for over 4 h (240 min). The present operating theatre complex of the UPTH allows for one operative day for maxillofacial surgery. However, with a rate of approximately three cases per month, the operating theatre is being underutilised. The challenges are numerous given the hurdles that maxillofacial teams have to overcome before they can operate. Although infrastructure is a huge problem in most Nigerian teaching hospitals, maintenance of existing facilities and operating theatres poses additional problems. There are challenges associated with operating tables, power supply, water supply, surgical equipment and accessories as well as sterile packs that make working in this environment almost impossible. The case mix as depicted by the classes of operation performed is broad and therefore offers excellent skills development and teaching, but the number of cases performed is not sufficient for learning purposes. In general, the more cases performed by surgeons, the better for the team. Recognising that there is an optimal number of cases required in a learning process, there is a paradigm shift in surgical skills training towards virtual reality simulation for the OR. This training technique is widely used by laparoscopic surgeons and have been revealed to improve the OR performance of surgical residents. Consequently, learning no longer depend on large case volumes because surgeons can practice as often as required using virtual simulation. Delays in running an operation list are not uncommon, and the causes are multifactorial. The study of 1531 elective surgical cases by Wong et al. revealed that delays were the most common type of error (33.6%), and more than half (51.4%) of the cases studied had at least one delay. The most common cause of delay in their study was equipment failure. The causes of delays in our maxillofacial OR are beyond the scope of this study and will require further studies. From the economic point of view, ORs are critical assets to all modern tertiary hospitals because they contribute up to two-thirds of a hospital's total revenue., For maxillofacial surgeries, the more major and major/smile train class of operation that the team can perform, the more resources the hospital will get from theatre revolving funds. The major operations will require hospital admission, general anaesthesia and blood transfusion while supra-major operations, in addition, are long and extensive operations. While supra-major cases are time-consuming, major cases are relatively time-saving and therefore is shown to be more cost-beneficial. The performance of more major cases promises to have a higher return on investment for the hospital. Increase dedication of human and capital resources, as well as OR days to the major and major-smile train cases are therefore favourable. The current OR facilities at UPTH are being under-utilised for many reasons. It is well-known that workers in teaching hospitals in Nigeria are prone to strikes. This situation produces disruptions in elective lists which is why only 54.7% operating day utilisation is observed in this study. While caution must be applied to using 'operating day utilisation' to measure performance, it must be realised that the 'late arrival time-in OR' (referring to knife-on-skin), reflects a delay in the onset of the operation list and therefore start-time tardiness. This is a big cause of wastage of both time and human resources in the hospital. Although maxillofacial operating days do not have separate morning and afternoon sessions and the longest cases were not scheduled first, Thorburn et al. identifies these practices as not beneficial. The authors opined that day-long sessions, mid-week sessions, and not doing the longest case first were most beneficial to theatre utilisation and they suggested that these must be considered in any redesign activity aimed at improving flow performance. Our maxillofacial teams were observed to have enough surgical workforce, as the various categories of surgeons and anaesthetist present are often up to a maximum number of four and five, respectively. The analysis showed that there is a need to improve OR management and put in place strategies that will optimise the present facility. The hospital management should ensure appropriate installation of electrical connections and air conditioning in the present facility, as well as ensure the use of genuine parts for equipment maintenance. These will offer the highest form of safety, as well as prevent disruption of operation lists. The goal for the OR can be set to achieve 90% utilisation of the available operating days. Furthermore, increasing the case rate from 2.8 per month to approximately 10 per month in the current OR will justify the need for capital investment and a possible cost-benefit expansion. The consultant surgeons and anaesthetists can reorganise how they work with their residents to discourage redundancy in the OR. Smaller teams working more frequently allows for more hands-on practise and enables rapid skills acquisition by the surgical workforce. When needed, larger teams can participate in cases that exceed 4 h to reduce human error from fatigue. A surgery-specific OR will only be effective if operating days are up to 3 or 4 times per week. Virtual simulation, a more affordable method of learning and practice of skills, can be used to supplement residents training. We suggest another review in a couple of years to re-assess the situation. The needs analysis showed that the maxillofacial case volume and output for the 62 month period reviewed do not justify investing in maxillofacial surgery-specific ORs. Such a capital investment, considering the gross underutilisation and peculiar OR management problems at the UPTH, is likely to result in a massive wastage of the already scarce resources. Onajin-Obembe B. From service to academics: Analysis of a change process in the department of anaesthesiology, University of Port Harcourt Teaching Hospital (UPTH), Nigeria. Int J Manag Bus Stud 2013;3:110-7. Jackson RL. The business of surgery. Managing the OR as a profit center requires more than just IT. It requires a profit-making mindset, too. Health Manag Technol 2002;23:20-2. Oh HC, Phua TB, Chuen S, Yen Lim JF. Assessing the performance of operating rooms: What to measure and why? Proc Singapore Healthc 2011;20:105-9. Marjamaa R, Vakkuri A, Kirvelä O. Operating room management: Why, how and by whom? Acta Anaesthesiol Scand 2008;52:596-600. Weinbroum AA, Ekstein P, Ezri T. Efficiency of the operating room suite. Am J Surg 2003;185:244-50. Gallagher AG, Ritter EM, Champion H, Higgins G, Fried MP, Moses G, et al. Virtual reality simulation for the operating room: Proficiency-based training as a paradigm shift in surgical skills training. Ann Surg 2005;241:364-72. Roberts KE, Bell RL, Duffy AJ. Evolution of surgical skills training. World J Gastroenterol 2006;12:3219-24. Ciechanowicz S, Wilson N. Delays to operating theatre lists: Observations from a UK centre. Internet J Health 2010;13:1. Available from: https://www.ispub.com/IJH/13/1/6740. [Last accessed on 2018 Jun 03]. Wong J, Khu KJ, Kaderali Z, Bernstein M. Delays in the operating room: Signs of an imperfect system. Can J Surg 2010;53:189-95. Thorburn H, Khanna S, Boyle J, Good N, Steyn M. Analysis of operating theatre utilisation to drive efficiency and productivity improvements. Stud Health Technol Inform 2014;204:163-8.